· PVC: This is known for being less expensive. However, it won't last as long in the direct sunlight as Hypalon before it starts to fade out. It does not tolerate sunscreen and insect repellent as well as Hypalon. · Hypalon or CSM Pro: This is known to last significantly longer than PVC when exposed to extended periods of sunlight. It also will hold up better to fuel spills, sunscreen, insect repellent and even exhaust fumes. Overall, Tender Care Boats suggests Hypalon tubesets on your yacht tender. 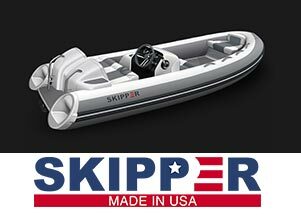 In fact, we believe in it so much we built our own Skipper 10’ and Skipper 11’ to come equipped with Hypalon tubes. We feel that the quality is superior and worth the investment. After all, you want the best boating experience possible and Hypalon will provide that for you for a longer time on the water. Tender Care Boats has been around the marine industry for over 35 years.